Wonderful as is the development of modern machinery for the manufacture of American textiles—machinery which seems almost human in the way it converts raw materials into finished cloth; just as surprising are the most primitive looms of the American aborigines, who without the aid of machinery make interesting weavings with only a bar upon which to suspend the warp threads while the human hand completes all the processes of manufacture. Modern man's inventive genius in the textile art has been expended upon perfecting the machinery, while primitive man's ingenuity has resulted in making a beautiful weaving with very simple means. No doubt could we know the history of primitive loom work in America prior to the coming of the white man, we would find an extended distribution of weaving, but all early textiles have been lost owing to the destructability of the material and the lack of climatic and other conditions suitable for their preservation—conditions such as are present in the hot desert lands of the Southwest and the coast region of Peru. 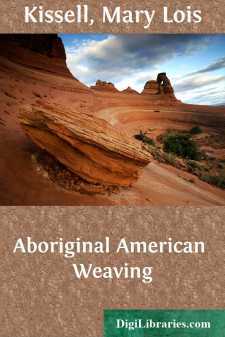 However, so many impressions of weavings have been found on early pottery as to assure us that beautiful work of this kind was made in eastern, middle and southern United States. In western British Columbia at the present time there are tribes carrying on certain forms of weaving which show four interesting types. The simplest type is the cedar bark mat woven of flat strips in horizontal and vertical lines. In beginning wide strips of the inner bark are hung from their centre over a crossbar of wood which is supported at either end by an upright beam. The halves of the strips hanging in front are then split into strands of the desired width and a line of fine twining woven across to hold them securely. The checker weaving of the mat is now begun at the left edge by doubling the weft element over the last warp and then weaving with the doubled element over and under one warp until the right edge is reached where it is turned back and slipped under an inch of the weaving just completed. shows a squaw at work on such a mat, and when she has completed this half of the mat the second half will be undertaken. She finishes the edge by turning up the warp ends below the last line of weft and binds them with a row of twining just above this last weft. FIGURE 2.—MAT WITH CHECKED DESIGN. In their industries, primitive people always utilize the materials found in their environment, because no means is afforded them, as in modern life, for the transportation of materials from a distance. British Columbia is rich in cedar trees, so it is not strange that material from this tree enters so largely into the weaving of this region. Cedar bark lends itself very delightfully to the technic of these mats, and its golden brown checked surface is at times crossed by black lines or broken by a group of black checks in simple designs. These vary greatly, but only one example () can be shown here. FIGURE 3.—PRIMITIVE LOOM WITH PLAITED MAT.